In this blog i wil show you how to optimize (tune) your Deployment. I can be short about this one because this job is done easy and fast using the VMware OS Optimization Tool (OSOT) tool which can be downloaded for free here. The tool is straight forward, just double-click to install and follow the instructions from there. You can create/import/export your own templates. A standard Windows 10 machine is filled with a lot of Universal Apps compared to a Server 2016 set. I think the cleaner the desktop the better. 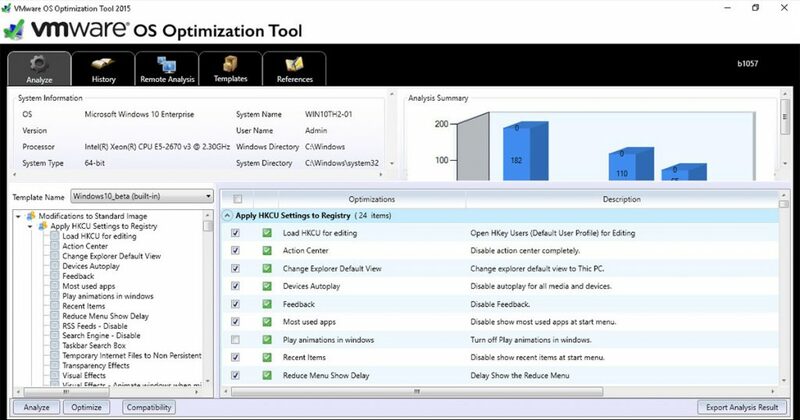 The OSOT tool does not depend on VMware Horzion View so you can use the tool for tuning your Windows VDI on other platforms too. My advice is to first check which applications you may need before removing them. All (new) user profiles will get a nice clean desktop. Howto: Manage Windows 10 Workspaces in your environment using RES ONE Workspace Manager. Dit bericht werd geplaatst in Blog op 10 februari 2017 door Rob Aarts.